This is a bittersweet book inspired by the true story of Driver, a puppy that was smuggled onto an Australian troop ship during World War One. When Matthew travels overseas on a troop ship to work as a stretcher-bearer, he smuggles his beloved puppy Digger on-board. Digger follows Matthew everywhere from the training grounds to the battlefield, and quickly develops a strong bond with the other soldiers, who make him his own little gas mask and a ball to play with. When Matthew goes into a more dangerous situation than usual, Digger is the only one who realises the potential danger and runs to save his best friend. The ending is heartbreaking, but at the same time, incredibly heart-warming- highlighting the true bond that can be found between man and animal. The illustrations in this book vary between coloured pencil and acrylic pictures and scribbled line drawings- all of an extremely high standard. There are also several pages where the story is told via Matthew’s handwritten letters to his sister Anna, explaining the situation in the war, and the experiences Matthew and Digger share. While the book is aimed at children, it is probably best for those in a slightly higher age bracket (perhaps 8-10 years of age) as the ending of the story may be slightly distressing for younger children. 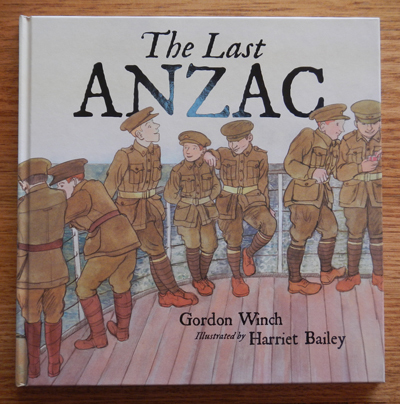 This picture story book was printed specifically to mark the Anzac Day Centenary (as we learn at the end of the book- which features the dates 1915-2015 and the immortal words ‘Lest we forget’), and it packs one hell of a punch when it comes to the seriousness of the topic. There are no character narratives or anecdotes here- the facts are laid out bare and to-the-point. Going by a timeline structure, this book chronicles the events of Gallipoli from 23 April 1915 to the present day, detailing the countries involved, the men that fell and the grimy details of life in the trenches. Each of the pages are illustrated with a collage of line drawings, real photographs and pictures of documents, medals and war memorabilia, creating a fascinating sepia-toned collection. This book is not really suitable for a younger audience, especially as some of the photographs feature dead bodies, but, at the same time, it is an important, mostly uncensored view of a war that children need to know about. This book is highly recommended, not just from a historical point of view, but for the wealth of information it provides. 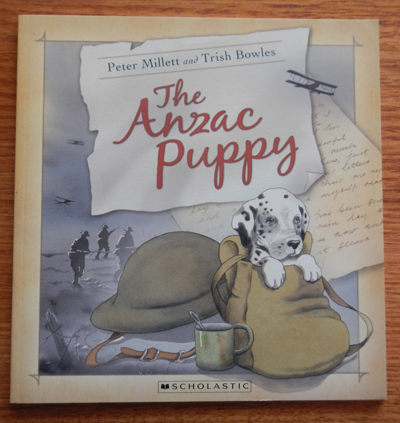 Based loosely on the events surrounding the mascot of the New Zealand Rifle Brigade 5th Battalion in World War One, The Anzac Puppy tells the story of Freda, a pup that was taken into the trenches by a young soldier. 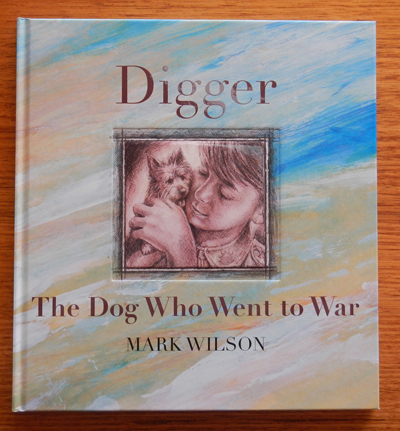 In this fictional story, Sam (a soldier) is given the puppy by a young girl named Lucy, who can no longer look after her in times of famine. Sam promises to take care of the puppy, and bring her back to Lucy after the war is over. It is this determination to keep his promise that sees him live out the war, despite all his friends dying around him. As Sam and Freda grow, and experience the harsh realities of war, Freda becomes a beacon of hope for the brigade and becomes a good-luck mascot of sorts. After the war is over, Sam returns home, keeping his promise to Lucy and ends up living his own happily-ever-after. This is a sweet story that, as mentioned above, is based loosely on true events. The author has included the real Freda’s story at the end of his fictional tale, so that readers can learn about the inspiring relationship between one dog and an entire brigade of New Zealand soldiers. Alec Campbell- the last living Anzac- died in May 2002 at the age of 103. The year before he died, he met with a young boy named James, who was able to talk to Alec and ask questions about the war and his experiences at Gallipoli. This picture story is based on James’ visit with Alec and the heroic story he was told. Enlisting in 1915, at the age of sixteen (he lied, as many did, about his age), Alec was sent overseas to carry water and stores from the beach to the soldiers in the trenches. Although he wasn’t involved in any fighting, the work was still dangerous, and he saw a lot of soldiers wounded and killed. Alec was sent home from the war after six weeks, when he became too sick to do anything, but his experiences in war-ravaged Gallipoli stayed with him for life. This story is thoughtfully told, and the brightly coloured illustrations of now are cleverly juxtaposed with the earthier tones of the wartime illustrations. Alec’s story, although not as ‘exciting’ as some, is still an important part of the Gallipoli campaign, and it’s well-worth reading if you want to learn about the war as seen from a non-combat perspective. 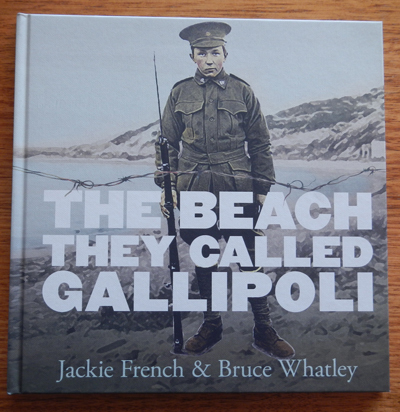 I had vaguely heard of Eric Bogle’s Australian folk song about Gallipoli, but I never really listened to it before I picked up this picture story book. 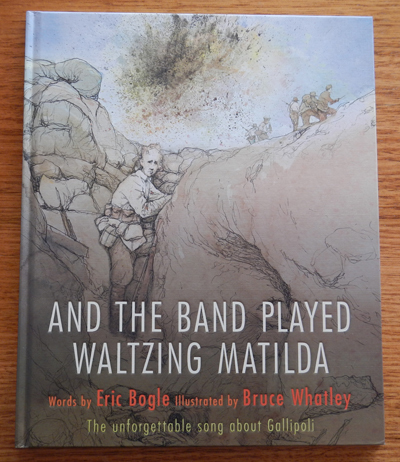 Illustrated by Bruce Whatley (who is better known for his drawings of wombats and various other picture book characters), this book brings the words of the song to life. Using starkly drawn and haunting imagery (inspired by photos and other articles from the Australian War Memorial archives, the Imperial War Museum and the media), this book differs from others that commemorate Anzac Day. More anti-war than others, this book shows the horrors involved- the death and the bloodshed, the crippled and wounded men that returned, and the many that did not. The sepia-toned illustrations only serve to highlight the sadness, hopelessness and misery that come from war. Bogle’s note at the end of the book further emphasises this, as he explains the origins of his song, and his goals behind it. While the book doesn’t come with a CD, it is possible to download Eric Bogle’s song from iTunes, and if you flick through the pages while listening to the lyrics, you can’t help but be emotionally moved by the imagery that is evoked. 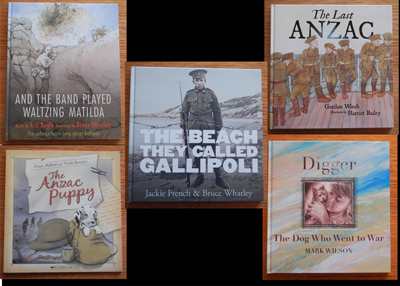 Since it's now Oct '16, can they still buy these books for Anzac Day '17? Or perhaps they could borrow them from there local library.